A. 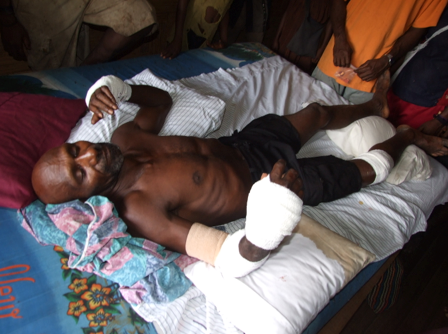 Direct Medical Attention- All medical attention is now provided by the Samban Clinic. We have secured the services of two qualified Ap Ma nurses (Mariana Posatia, and Alex Kamba) who are doing a fantastic job of meeting the needs of the Ap Ma people. B. Medical Evacuation Services- We continue provide emergency evacuation services via river with our canoe and outboard motor and if need be via plane. C.Preventative Medicine Education- We do not just treat minor injuries and ailments but we use those times to educate people as to how they can prevent some of the common ailments. We also use the schools a teaching ground. Nurses visit classes to talk about health and safety and work closely with our schools to support health and growth of local students. This year (2013) we plan to establish the first Ap Ma healing garden. Using native and introduced plant species we will plant a small garden near the clinic to educate the people on ways to use these natural “medicines” as a first line of defense again illness. 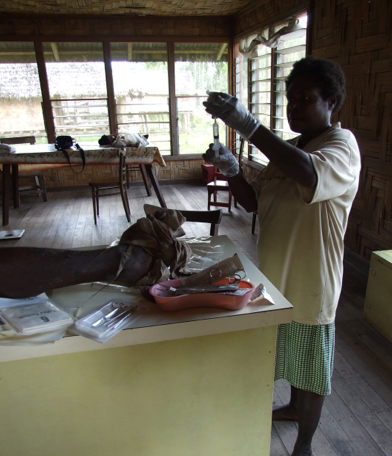 D.Samban clinic - was established in Nov 2007 and registered with the PNG government to provide basic care to the surrounding 5 village area. Samban clinic serves approximately 5000 people and is open 5 days a week M-F 9-3. Each patient is expected to pay a nominal outpatient fee. In 2012 we started construction on our new clinic building which will enable us to provide in-patient service by the end of 2013. We continue to work closely with MAF (Mission Aviation Fellowship) and Samaritan Aviation for our medical evacuations. E. OIPNG Scholarship Program- By speaking in schools and keeping our clinic open and friendly we encourage young children to consider the study of medicine. We offer scholarship opportunities to help those who have a desire to fill this need in our area. This program has been one of the highlights of our work here in PNG. Alex Kamba who now works in our clinic was the second scholarship winner and we are so thankful for his willingness to study and his desire to help the Ap Ma people through service in the Samban Clinic. Two others are studying hard in training centers Amina Maso, and Jeffery Norman, both set to graduate in Dec 2013.